The Del Sol Beachfront Condominiums include fully equipped kitchens, airy living and dining rooms, TV, ceiling fans, central a/c, in room safe, and CD players. Thorough daily maid service, sheets and towels, soaps and shampoo, and bottled purified water, are all a part of our service to you. Wireless internet access on the premises. Enjoy uninterrupted views of the Caribbean Ocean and the lush jungle from your private balconies. Relax in the hammocks. Wander along the beach. Visit the mystical Mayan Ruins of Coba and Tulum. Shop at the open air markets. The expansive three bedroom units include colorful artwork and tapestries, a jacuzzi in the master bath, and comfortably sleep 7 guests. The master bedroom has a king bed and ocean views. The second bedroom has a twin bed and full bed and private bathroom. The third bedroom has a private entrance, queen bed, balcony overlooking the jungle, and private bathroom. Cribs are available at no extra charge. Rollaway is $10/nt. 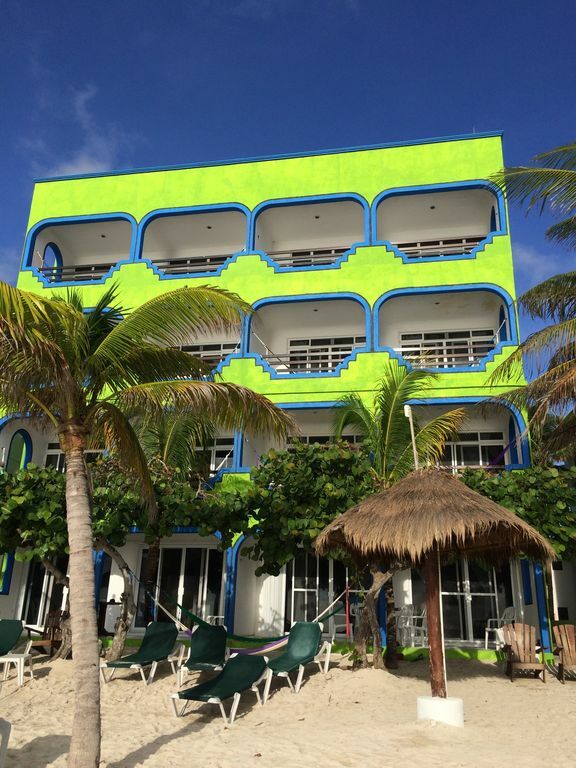 Vista del Mar/Del Sol Beachfront condominiums are close to the famous snorkeling spot, Yal-ku Lagoon, numerous local restaurants, and Akumal Dive Adventures dive shop. The Corner Store is located nearby with basic food items and beer, soft drinks, and snacks for sale. La Buena Vida Restaurant offers drinks and lunch at the really fun beach bar and fine evening meals in their upstairs dining room. There is a swimming pool on the premises for guests of the restaurant and Vista del Mar/Del Sol Beachfront condos. Solitude, snorkeling, lazy days and natural beauty. Located on Half Moon Bay beachfront. Some of the condos at Del Sol are on an upper level and there is no elevator.